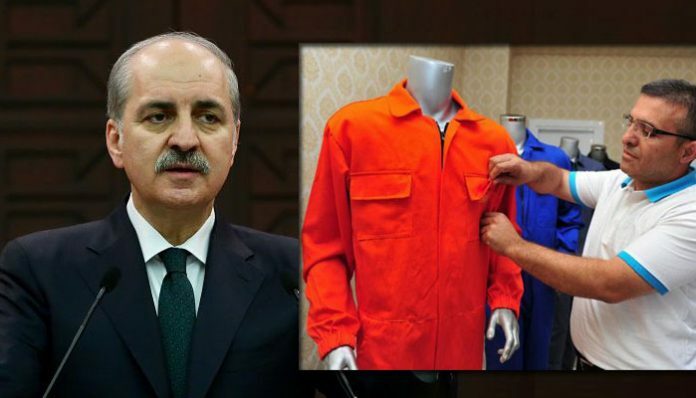 Turkish Deputy Prime Minister Numan Kurtulmuş said on Monday that Justice Ministry officials are working to design a special uniform for suspects who are allegedly linked with Turkey’s Gülen group and accused of attempting to stage a coup in July 2016 to wear during court hearings. The military coup attempt on July 15, 2016 killed at least 249 people and wounded more than a thousand others. Immediately after the putsch, the Justice and Development Party (AKP) government along with President Recep Tayyip Erdoğan pinned the blame on the Gülen group and initiated a widespread purge aimed at cleansing sympathizers of the group from within state institutions, dehumanizing its popular figures and putting them in custody. Turkish Justice Minister Bekir Bozdağ announced on July 7, 2017 that at least 50,504 people have been arrested and 168,801 have been the subject of legal proceedings due to Gülen links since the coup attempt.